A huge challenge for growing cities is provision of core services and infrastructure. Every time a new neighborhood crops up, services like roads, water and sanitation, education, and health centers must be extended to cover new residents. In practice, cities need land to make this work. Typically, new development – especially lower-income housing – crops up in distant, un-serviced locations because it seems affordable. But extending services to these areas is expensive for cities – so expensive that sometimes, they don’t do it at all, leaving residents on their own for things like water and energy. Living farther out also means higher transportation costs. Ahmedabad, India’s fifth-largest city, has been trying something different: a process known as the Town Planning Scheme (TPS). With TPS, the city has been able to obtain land for public purposes, such as low-income housing and utilities, while avoiding much of the haphazard, un-serviced expansion that characterizes many other Indian cities. 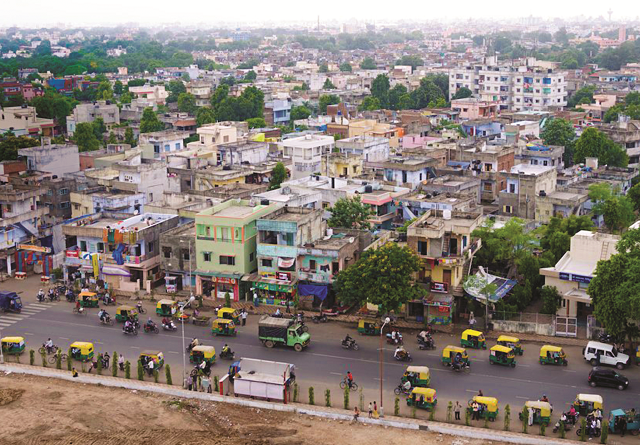 A new case study in the World Resources Report, “Towards a More Equal City,” explains the conditions that enabled this mechanism to be adopted in Ahmedabad, the benefits to equitable land allocation in the city and the limitations that slow down the process. One of the most common ways cities acquire new land for public services is through eminent domain. With TPS, as with eminent domain, Ahmedabad appropriates land to build public infrastructure, but plots are not expropriated, rather their boundaries are readjusted to create space for roads and underlying infrastructure. Any land that isn’t used is returned to the landowner. Under TPS, compensation to landowners is also adjusted against the cost of government-provided infrastructure, meaning that landowners and the city share costs as well as benefits. Though disputes over appropriation still occur, the result, generally, is a more collaborative process, one where landowners are included, not displaced. Draft stage.The TPS location is identified, announced and negotiated with the landowners. Once approved, land is transferred to the planning authority to begin infrastructure implementation. Preliminary stage. A Town Planning Officer is appointed, and plots are reorganized based on negotiations with the landowners. Final stage. The Town Planning Officer settles landowners’ compensation, minus “betterment charges,” which reflect the increased value of the land based on the new investments. In Ahmedabad, the TPS was first put in place in 1915, when the city was under British rule. It became much more effective after a 1999 amendment empowered the city to appropriate lands earmarked for roads once a TPS draft was approved, accelerating construction and paving the way for other infrastructure to come later. The changes also enabled the process to finance itself by allowing the city to sell some land. These changes revamped the classic TPS process resulting in nine times as many TPSs prepared from 2000-2016. In the 10 years after the amendment, twice as much land was developed with infrastructure, compared to the preceding 25 years. There are now 480 TPS areas within Ahmedabad’s metropolitan area that are part of a long-term development plan for the city. 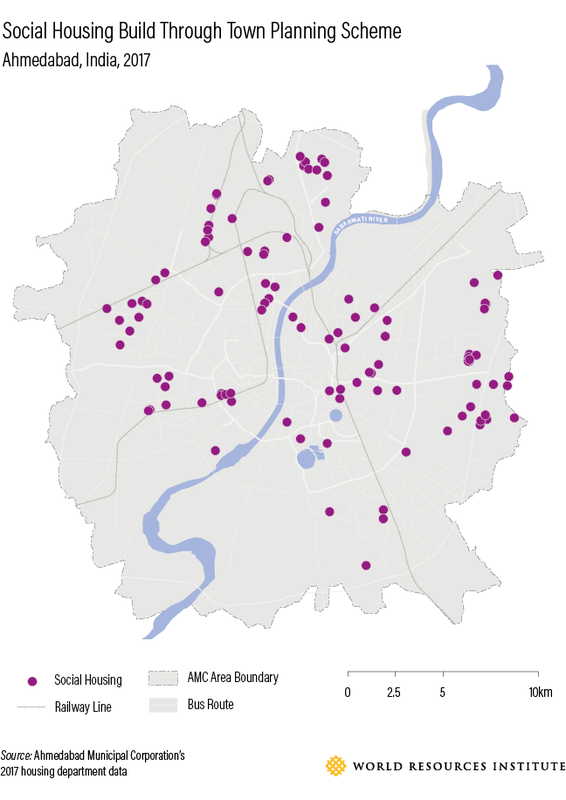 In 2010, Ahmedabad used TPS to appropriate 48 square kilometers (nearly 12,000 acres) of land for roads, utilities, green space and low-income housing with amenities. Increased street density.More compact, coordinated and connected develop has improved accessibility. The average trip length in Ahmedabad is seven to eight kilometers, significantly shorter than in comparably sized Indian cities, such as Bengaluru, Hyderabad and Pune. More low-income housing.About 88,000 new dwelling units have been constructed for people evicted as a result of earlier infrastructure and beautification projects. Unlike other housing programs, TPS housing units are also well-distributed spatially instead of being concentrated in the city’s periphery, improving access to jobs and services. Thanks in part to the TPS process, social housing in Ahmedabad is more centrally located than in many cities, giving greater access to jobs, services and amenities for residents and reducing the costs of reaching new developments with services. The TPS is flexible enough to accommodate pre-existing development, including informal settlements, in order to minimize conflict with residents of the city’s large informal sector. In Danilimda, part of a large informal settlement called Bombay Hotel, residents objected to giving away land. In response, the Town Planning Officer assigned to the project reduced the amount of land appropriated and adjusted road alignments planned for the area. Even though these decisions limited provision of infrastructure and amenities to the area, minimizing demolitions was more important to residents and the TPS process led to a compromise. While TPS has proven to be an effective tool for urban land provision in Ahmedabad, it hasn’t been perfect. Though more participatory than eminent domain, it is not fully participatory. Only landowners are consulted during negotiations, omitting people who might occupy but not own land, including formal and informal tenants. An even bigger challenge has been timely implementation. Even though many more TPS drafts were prepared after the 1999 amendment, only 18 percent were actually realized. Most drafts stay in limbo for years; in the interim, people reoccupy the land and the process is undermined. And sometimes financing never comes through. For example, the Hansol TPS was finalized in 2004, but it took another six years to get the funds to build roads included in its plan. In general, the TPS has worked well in urban extension areas – i.e., areas in the city’s immediate periphery that see short-term appreciation in land values. But it has been less effective in distant farm land sites or in dense locations that are already fully developed. Among available approaches to generating urban land for new infrastructure and amenities, Ahmedabad’s TPS mechanism has been relatively successful. It has enabled transformative outcomes in the city, such as the construction of thousands of well-distributed social housing units and the expansion of a well-planned road network that has reduced trip lengths, increased connectivity and helped enable India’s largest bus rapid transit system. The TPS alone is not a panacea to ensure more equitable cities, but Ahmedabad’s experience offers important lessons for other cities striving to grow in a practical and more participatory manner. India’s Boom Pushed Cities to Their Limits. Here’s How Pune Coped.